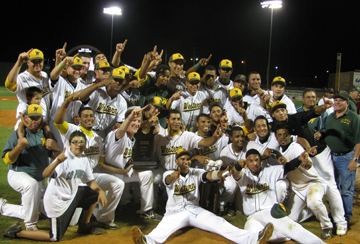 Western Pioneers claim the 2011 NJCAA World Series Championship after defeating Jones County Junior College 11-1. Western Oklahoma State College’s Pioneer baseball team captured the NJCAA Division II National Championship, June 4, 2011 in Enid Okla., at the David Allen Memorial Ball Park. Western defeated Jones County Junior College, Mississippi, 11-1 in the final game played to a packed stadium. The big win came after a season of ups and downs and four years of getting to the world series without taking home the prize. The NJCAA title marked the first time an Oklahoma junior college was crowned national champions since Bacone College accomplished the feat in 1967. Under Russell's tutelage, the Pioneers once again led the country in hitting and produced the second National Player of the Year, Jhiomar Veras. Over the past four seasons, Western led the country in winning percentage (210-49, 81 percent) while making their fourth consecutive appearance in the world series and fourth consecutive 50-win season. The program produced nine All-Americans and 31 professional players since 2004. Western boasted of eight draftees and signees in 2010 and featured 2nd round draft choice Andrelton Simmons. In addition Coach Russell was named Region Coach of the Year five times, District Coach of the Year four times and was the 2011 National Coach of the Year.